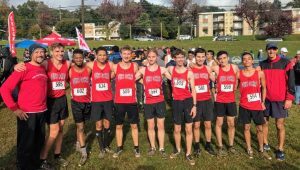 The cross country teams competed at the MCPS Championship meet on Saturday 10/27. The county championship meet is annually our favorite meet and is generally the final meet of the year for most of the team. Unfortunately, due to heavy rain in the days prior to the meet, the 9-10 B race was cancelled, leaving those athletes without a final race. The fact that we were able to complete at all was due to a compromise between the meet directors and the City of Gaithersburg to run just the varsity and the 11-12 B races. 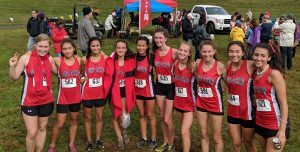 The course was muddy, but held up well through the afternoon resulting in every single Cougar running a faster time on the course than they ran on September 18th when we competed against Gaithersburg in a divisional meet. (See below for a time comparison). The most improved Cougar between the two meets was Isabela Newlands, who improved by 4:25 in her first varsity-level race at the Championships. The most improved boy was Timmy Shiner, who improved by 2:04. The girls varsity finished 16th in the championship race, despite missing their #1 runner, Margaret Lilyestrom. Knowing this, our emphasis was on pack running and the girls boasted the smallest time spread in the entire county from their 1st runner to their 5th runner of :54 seconds. The varsity was lead by freshman Talia Dantus in 81st place; followed closely by junior Emily Miller in 85th. In the 11-12 B race, junior Alyssa Pickoff started the day with 27:49, good for 83rd place. The boys were just as good as pack running despite missing a key varsity runner Noah Buchsbaum. They had the 3rd smallest 1-5 spread in the county of :59. The goal for both teams was less than a minute. Mission accomplished. The boys varsity was lead by senior Jordan Gaskins in 85th place, followed closely by junior Jonny Fontek in 88th. Overall, the team placed 18th. In the 11-12 B race, senior Jason Kearney (who gave up his varsity spot along with Will Spano so that a teammate could compete) was our top finisher in a personal best time of 19:09. The county championship is also our traditional senior day. Following the races, our seniors were recognized by our principal Mrs. Thomas and presented with flowers by our athletic director, Mr. Rabberman. During our team picnic, the seniors presented their “senior wills”; a statement about the legacy they are leaving behind to the team once they are gone as well as a reflection on their overall QOXC careers. The following seniors were recognized: Noah Buchsbaum, Emily Chee, Jaren Ezrin, Jordan Gaskins, Martin Ivanchev, Jason Kearney, Margaret Lilyestrom, Madison Mills, Hannah Myers, Dylan Olen, and Bradley Pasekoff. Their heartfelt words will hopefully be taken to heart by the crop our returning runners. Thank you seniors! Time comparison for athletes who competed on the Bohrer Park course on 9/18 & 10/27.